Are you thinking of painting? Yellow is said to create joy, bring concentration and heal digestive ailments. Every so often I see a glimpse of yellow that strikes me. Yellow is cheery and retro but, not a color that I would consider for my 1951 Oakland Ranch home. 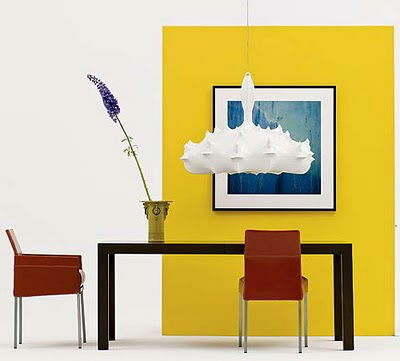 When I imagine yellow, I think of the Cleaver family and a kitchen with yellow walls and a red laminate kitchen table with chrome edging... Today I picked up my Design Within Reach catalog and saw this photograph of a room painted yellow. It changed my mind of yellow. This mustardy shade is warm and modern.